As Olympic season starts go, clocking your quickest ever summer opener with a world-leading time isn’t a bad way to begin and Eilidh Doyle is eager to build on her Doha Diamond League performance as she works towards Rio. The European 400m hurdles champion ran 54.53 on May 6 to beat a field including Commonwealth champion Kaliese Spencer and last year’s world bronze medallist Cassandra Tate and better her previous quickest season opener of 55.43, which was also run in Doha in 2014. “I’ve always said in the past that I never really open up that well, I take a few races to get going, and I wanted to not do that this time,” says Doyle. “The race just went as best as I could have hoped, really. Training has been going really well, I’ve been injury free, I’ve been healthy, but sometimes you just don’t know in that first race how things are going to do. I was just delighted that it went smoothly, it was a good solid run and obviously I took the victory. It couldn’t have gone any better. Having married former sprinter Brian Doyle last October, the race was the Scottish star’s first under her new name. “My husband claims it’s all down to the name – he has taken full credit for it!” laughs the 29-year-old Commonwealth silver medallist, who has also won world and European 4x400m relay medals competing under her maiden name of Child, when discussing her successful start to the season. So what can she put it down to? “One of the big changes that we’ve had this year is I’ve taken on an extra track session,” explains the Malcolm Arnold-coached athlete, who has gone from four track sessions and two gym sessions a week to five on the track and one in the gym with extra hurdles work. Currently in Tenerife on a training camp, Doyle is next in action at the Rome Golden Gala on June 2 before the Birmingham Diamond League meeting on June 5. 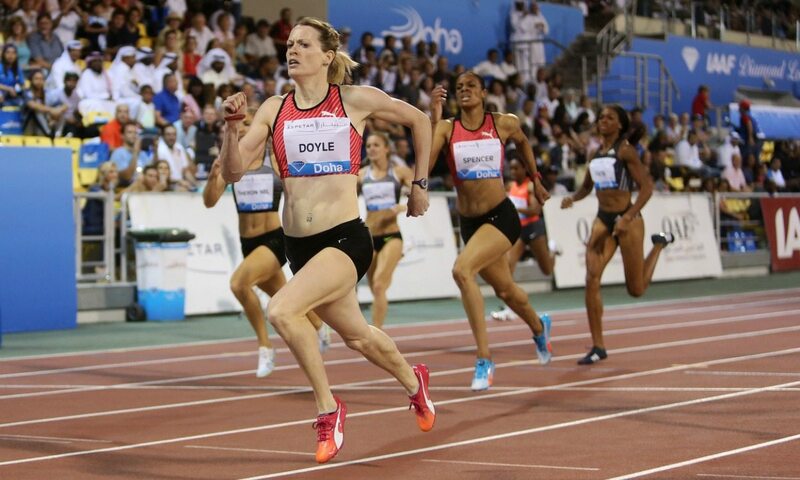 “My PB is from Birmingham in 2013, so I’ve always ran well there,” says Doyle. On whether she feels in shape to better her 54.22 from three years ago, she adds: “Yes, definitely. I thought I was in PB shape last year as well but I just felt that I couldn’t put the race together at the right time. Doyle has voiced her disappointment with her performance at the IAAF World Championships in Beijing last August but says her sixth-place finish has given her extra hunger for success this year. “Last year, making that final at the World Champs, I felt like that was an opportunity that I missed by not getting myself on the podium there,” she explains. “Going into that race in Doha in particular, normally I would step on to that track and probably be looking at who is in the race, but I just thought if I go and run the way I’ve been running there’s no reason why I can’t win this race. Although Doyle would have liked to have defended her European title in Amsterdam this summer, Rio is the focus, though she might make the Netherlands trip as part of the relay squad. “Doha is the starting point,” she says. “It’s now building on that and focusing on each race as it comes – hopefully making sure that when it comes to Rio I am in the best shape possible to go there and contend with the rest of the girls. “When I stepped off the track after Beijing, I knew I hadn’t performed to my best and I would hate to feel that after the Olympics.